Was it 'three times' or 'free time' on McConnell tape? 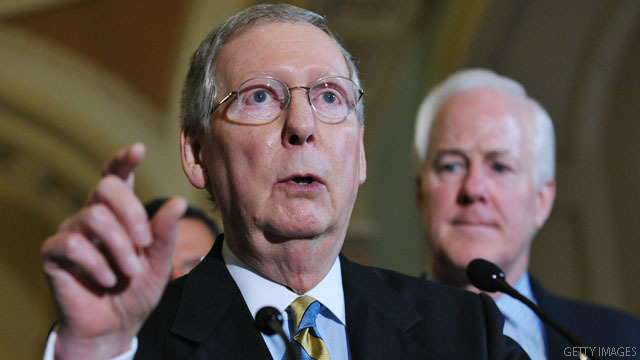 (CNN) - One of the questions to emerge from that secret recording of a Mitch McConnell campaign strategy session is whether it proves the Senate Minority Leader is caught on tape misusing his congressional staff. The DC-based watchdog group, Citizens for Responsibility and Ethics and Washington has asked the FBI to investigate. CREW officials said the audio recording obtained by Mother Jones magazine raises questions "whether Sen. Mitch McConnell (R-KY), violated federal law and Senate rules by misusing Senate staff or resources to conduct opposition research on potential campaign opponents." In the Mother Jones transcript, a campaign strategist at the McConnell meeting in February is quoted as thanking "LAs" or legislative assistants (legislative assistant being a title for a specific congressional staff position) for their work in developing opposition research on potential opponents, including actress Ashley Judd, who has since decided against a run for the Kentucky seat. "So I'll just preface my comments that this reflects the work of a lot of folks: Josh, Jesse, Phil Maxson, a lot of LAs, thank them three times, so this is a compilation of work, all the way through," the unidentified strategist is quoted as saying in the liberal magazine's transcript. But listen closely, and it's also possible that same adviser may have said "thank them for their free time." It's a bit garbled and all in the ear of the beholder. Listen for yourself here. Congressional staffers are permitted to volunteer their personal time to political activities. "This is a frivolous complaint based entirely on a maliciously transcribed, illegal recording and Melanie Sloan and CREW should be embarrassed for wasting the time of the Ethics Committee and the FBI," Brad Dayspring, a spokesman for the National Republican Senatorial Committee, wrote in a statement. "More importantly, Melanie Sloan should explain CREW's participation in a December meeting amongst Liberal groups where Mother Jones has reported that those present discussed "trying to oust Senate Minority Leader Mitch McConnell." In the meantime, a source close the McConnell campaign confirms to CNN the FBI has pulled surveillance tape from the Kentucky building where the Minority Leader's campaign headquarters is located. The source said the FBI's work suggests agents are looking into an "external source" for the audio's recording, not a leak from the McConnell campaign. McConnell told reporters Tuesday he suspects a liberal Kentucky group is responsible for what he called a "Nixonian" operation. "They apparently bugged my headquarters," he said Tuesday. An actual bugging of a political campaign is so rare the allegation from the top Republican in the Senate immediately raised eyebrows across Washington. Retired FBI agent Tom Fuentes, a CNN contributor, said the accusation warrants an investigation even if it sounds, as he called it, "pretty-far fetched." "To actually do it, most serious campaign operators understand the ramifications," Fuentes said. It really doesn't matter. However what does matter is that the Senate Minority Leader plays in the politics of self destruction and dehumanization. He is a big part of what's wrong with Washington. Time to send him packing. This goof is going down in flames in 2014. Whops! McConnell is just another partisan punk. This idiot is so out of touch it's crazy. You might as well pack up turtle man, you are done!!!! Technology being what it is today....if the right people want to know what was said....it will not be a problem to pin down!!! Personally I hope they procede because I don't trust McConnell any farther than I could throw him.This person is and has been proven to be one of the most devious and troublesome on the political scene and I hope he is exposed again!!!! Since Mitch McConnell enjoys playing the victim , maybe he bugged himself . One could only imagine all the conversations at meeting regarding making Obama a one term President . I do not care–just get rid off this nasty animal in next election–pass TERM-LIMITS ON SENATE AND CONGRESS. It seems "Thank them three times" is referring to Josh, Jesse, and Phil Maxson, one time for each individual. To say for "thank them for free times" dose not make sense grammatically. He is not sorry for what was said, only that he was caught. The nerve of him complaining that his wife is being attacked because of her race, yet he was in agreement with the Tea Party attacking President Obama and his wife. Karma is a you know what and he is getting his. I am so happy. McConnell is nothing but a mean spirited racist who thinks that he has everyone fooled. Maybe in Kentucky but not the rest of America. He needs to get out and tour the real America. Funny...where was their outrage when a conservative activist attempted to bug a democrats office back in 2007 or so? Keep the heat on him! Maybe sparks will start flying out of his head as quickly as his lies. I think McConnell is an alien. Just look at his photo. 2014 can't come fast enough to clean up in both chambers. First on the list: Mitch McConnell. What difference does it make? With or without the tapes, the senator is/was unfit. The tapes only confirm what most of us already knew and that is he needs to go. Period. Amazing how many people here simply want to blame the victim. Oh well, what goes around comes around. Investigate if his staff was on the government payroll during the meeting because that definitely is illegal. So, the liberal sissies who secretly recorded him are going to prison, while liberals pretend they never personally attacked people like Sarah Palin. Obama called her a pig. Did McConnell do that to Judd.? Liberals – they can dish it out, but they can't take it. Some info is coming out that it may have been recorded from outside the room because the conversation was clearly audible in the hallway, which may make what was audible outside the room public and not private. Courts have found this type of situation not to trigger the issue of whether anyone consented to the recording. For example, an investigator who secretly recorded a conversation taking place inside an apartment, but which was audibleaudible from the sidewalk, was found to be perefcty legal. Same with paparazzi style crap where they secretly record a couple of hollywood people having a conversation at a restaurant's outdoor table. Here, the hallway was not so obviously a public space because it was his campaign HQ, but it was during an open house event to which they invited the public, so it presents an interesting question. In any event, even if the two people who supposedly took the risk of doing this are found to have done something wrong, this still means that McConnell's nonsense about "bugging" and "gestapo style tactics" was wrong and asinine and a total overreach in terms of how it went down. It sounds more along the lines of McConnell and his staff totally messing up and assuring their privacy as they discussed something that was clearly disgusting and incendiary. Maybe we can get an FBI two-for-one deal - they can search for the evil-doer who recorded the conversation and prosecute McConnell for breaking the law at the same time. Sounds like good value for our tax dollars. If Mitt Romney proved anything in his failed Presidential campaign it's no politician can ever assume the cameras and microphones are turned off. Clearly McConnell hasn't figured that out. And his fist-pounding outrage over someone's audacity to tape him, McConnell has only brought more attention to the taped conversation. Do you have to flunk an IQ test to become a member of the Republican party? Shame on Democratic Super PAC for illegally recording private conversations. Dem's didn't care for it when it happened to them. Remember Watergate? But, politics does. Hence we have Super Dup-per PACs running the show. Let's just see how quickly CNN, MSNBC, ABC, CBS and all the liberal news papers and magazines publish the real story now? As for Judd, stick to taking care of your husband and kids. That's enough to manage. You might get a Talk Show on some liberal network – just hold out for lots of money. So, us poor people can live off your taxes.